Mother and newborn baby doing selfie. Maternity concept. Parenthood. Motherhood Beautiful Happy Family Stock Video Footage. Mother and her Newborn Baby. Happy Mother and Baby kissing and hugging. Resting in bed together. Maternity concept. Parenthood. Motherhood Beautiful Happy Family Stock Video Footage. Mother and newborn baby doing selfie on bed. Resting in bed together. Maternity concept. Parenthood. Motherhood Beautiful Happy Family Stock Video Footage. Mother and small baby boy doing selfie on bed. Resting in bed together. Maternity concept. Parenthood. 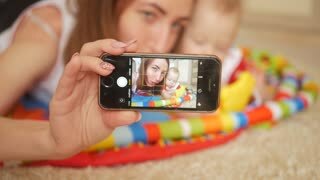 Motherhood Beautiful Happy Family Stock Video Footage.